Those were the words from my friend in Houston, a no nonsense physician and mother, when I asked her for a straight answer about local needs post Harvey. Let’s be honest about that phrase. I did not want to be here doing this. Needles scare the ever loving everything out of me, and I’m a total wuss about blood draws. But to know the need exists and still do nothing about it? Somehow that seems worse than not caring at all. So this morning I put on my big girl britches and showed up. Right after an early morning gym session, endorphin high making me braver than usual. “Take me now before I change my mind,” I told my husband. One driver’s license check in later, I was sitting in an interview room with Nurse Lynn, resisting with every fiber of my being the urge to make nervous chatter. She must’ve sensed it too, patting my hand gently before I started the self-directed background questionnaire. After a finger prick that validated my red cell counts are within donor range (healthy hemoglobins, hey! ), I was shaking hands with Nurse Shelly, who gave me a stress ball, a pillow, and the sweet assurance of someone who loves what she does each day. You people really are everywhere, aren’t you? 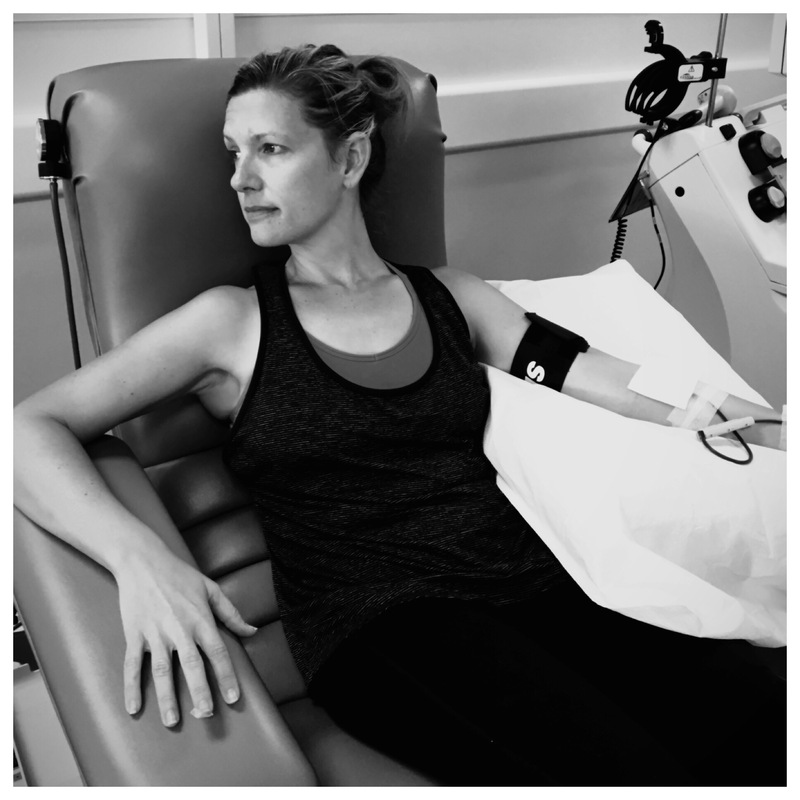 She was donating platelets, and indulged my newbie questions with more kindness than was necessary. Whoever you are, Auburn Lady, thanks for the friendly word. And to an Alabama fan. On the eve of SEC football returning, Hallelujah Amen! Vein check complete. Tourniquet tightly tied. Rubbing alcohol applied. A pinch scarcely worth the mention, instructions to squeeze the ball every 10 seconds or so, and a few moments to contemplate why I was here. The thing I said I’d never do, for the most selfish of reasons. I don’t think 10 minutes passed before the machine next to me spit out a series of beeps, and Nurse Shelly reappeared, telling me I “did good” and to scoot on over to the refreshment bar for a snack. It’s seriously that easy, y’all. The worse part? Daytime television noise, which I find the most depressing thing ever during sunshine hours, second only to stepping into a room with the shades drawn. Next time (and yes, there will be a next time), earbuds. And on that playlist, the very song I heard yesterday when I first had the nudge to donate and was trying to rationalize all the reasons I couldn’t/wouldn’t/shouldn’t. Previous Previous post: My kind of kale. Wow, we all need to remember every day to care and act on our feelings. I am so proud of your unselfish gift. Great Message! Thank you Eleanor! We don’t know what we’re capable of doing until we try! And fear is never “stupid.” Just something to overcome!